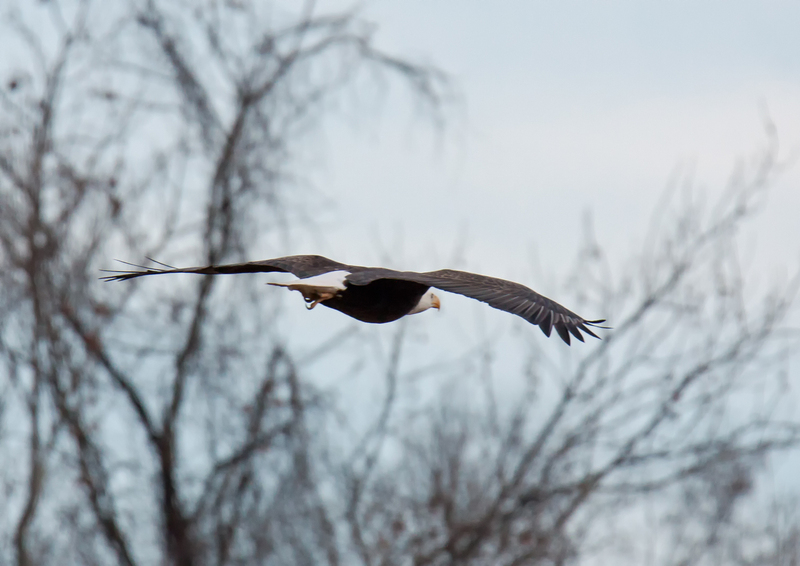 Most of my readers know that I love to photograph Bald Eagles. (Haliaeetus leucocephalus). When I am lucky enough to catch one in flight, it usually is just as the eagle is leaving the tree or when it is high in the sky. About two weeks ago, I manage to capture this eagle from a different perspective as it flew by at a relatively low level. It is not the sharpest image I have ever taken, but there is something about the outstretched wings and the glimpse of the head under the wings that I really like. I really do like outstretched-wing photos, and this is a nice one. Nice Mike! Always enjoy seeing your Eagle images! There IS something about that angle. Love it. Thanks, Molly. Your comments are always so supportive and encouraging.